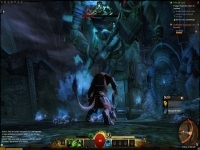 Guild Wars 2 - Supported software - PlayOnMac - Run your Windows applications on Mac easily! Plus de 250 ans se sont écoulés depuis1 la victoire des héros sur les Destructeurs dans Guild Wars: Eye of the North, le monde a bien changé et, en Tyrie, l'espèce humaine n'est plus la race prédominante. Outre l'émergence des nouvelles races, plusieurs grands cataclysmes se sont abattus sur le continent. Ces catastrophes ont, pour la plupart d'entre elles, été causées par le réveil des dragons anciens, des créatures qui peuvent rivaliser avec les Dieux, dont le premier a été Primordus qui était derrière l’apparition des Destructeurs. 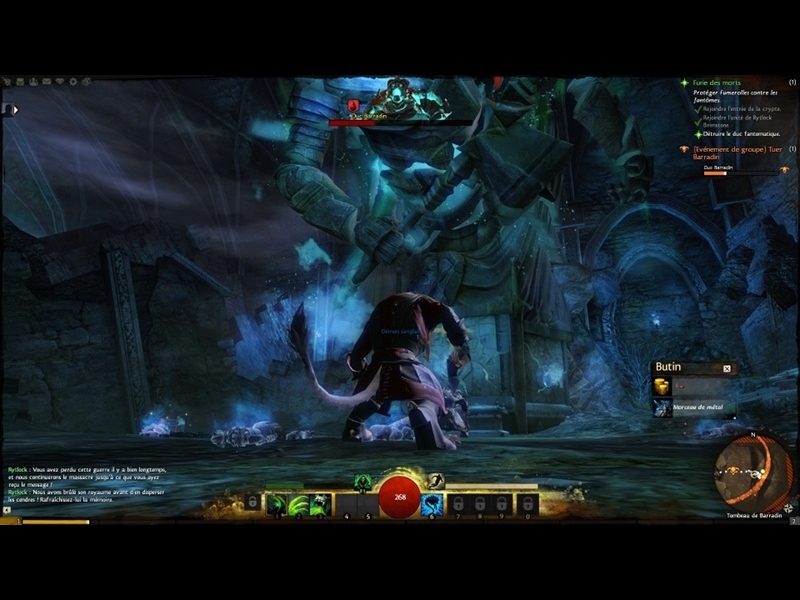 Guild Wars 2 takes place in the high fantasy world of Tyria, 250 years after the players' defeat of the Great Destroyer in the Eye of the North expansion. Five so-called Elder Dragons sleeping beneath the continent have awoken in the time since Guild Wars, causing widespread destruction to Tyria and corrupting its inhabitants. The once dominant humans of Tyria are in decline, supplanted from most of their land by natural disasters and war with the charr, who have finally reclaimed the last vestiges of their ancestral homeland of Ascalon from the humans. To the north, the norn, a proud race of Nordic hunters, have been forced south by the rise of Jormag, the elder dragon of ice. In the west, the technologically advanced asura have been forced to establish permanent homes above-ground after the minions of the first dragon to awaken, Primordus, took control of the Depths of Tyria. Near the forests where the asura make their home are the sylvari, a new race who have appeared in Tyria in the last 25 years, unaffected by the difficulties that plague the other races but with some as yet unexplained connection to the Elder Dragons. POL_SetupWindow_menu_list "$(eval_gettext 'Select architecture')" "$TITLE" "auto~x86~amd64" "~" "auto"
mkdir -p "$WINEPREFIX/drive_c/$PROGRAMFILES/ArenaNet/Guild Wars 2"
cp "$SETUP_EXE" "$WINEPREFIX/drive_c/$PROGRAMFILES/ArenaNet/Guild Wars 2/Gw2.exe"
POL_Call POL_Wine_InstallCDROM "1" "w" "GW2Setup.exe"
POL_Call POL_Wine_InstallCDROM "2" "w" "Gw2.js2"
POL_Shortcut "$FILENAME" "$TITLE" "$TITLE.png" "-dx9single -autologin" "Game;RolePlaying;"
0028:err:winediag:query_gpu_description Invalid GPU override 10de:1140 specified, ignoring. err:winediag:init_driver_info Invalid GPU override 10de:0615 specified, ignoring. fixme:seh:RtlCaptureStackBackTrace (0, 128, 0x2a3bce0, (nil)) stub! I'm not sure what to do and would appreciate any help. I tried the PlayonLinux with the AMD64 install with Wine2.8-staging, also the 64bit version, and added the additional video option. Emulated the desktop screen in Wine with 1920x1080 to my screen size. It crashed at first attempt to install but I selected the overwrite option and installed again and it finished the install. Other than that, It is currently running as if it is on Windows. It exceeded my expectations. It plays as if it could be a native client. I am a happy camper. It looks like it is only getting about 35-40FPS when looking at the screen options in game, but it feels like it is performing alot better than that. On another note. I am playing on Kubuntu 17.04 64bit, With a Lenovo K410 thinkcenter 2.3 dual core processor, NVIDIA GTX760 2GB video card with the latest driver available in the repositories. I also wanted to add since I missed it when typing the first message that I used the Guildwars2 64bit client, so all of the setup is 64bit. I tryed Guildwars2 with Wine 2.1 it works great! Game launch but i only have sound and no picture. Seems to be an incompatibility with my radeon Fury. ?Installed and ran just fine on Linux Mint 17.3 Cinnamon 64 Bit. With a 32bit virtual drive running wine 1.7.35 with windows version set to Windows 7. Il foncionne si je choisi l'architecture AMD64, si en mode AUTO, il plante a l'installation... Jusqu'à maintenant, j'ai pu me logger et j'attend d'avoir assez téléchargé de fichier pour l'utiliser. Today's update seems to have broken the game. Game crashes apon play. fixme:winsock:WSALookupServiceBeginW (0x33f690 0x00000ff0 0x33f6d8) Stub! fixme:win:RegisterDeviceNotificationW (hwnd=0x30cb2, filter=0x33f748,flags=0x00000000) returns a fake device notification handle! fixme:winsock:WSALookupServiceBeginW (0x33dba0 0x00000ff0 0x33dbe8) Stub! 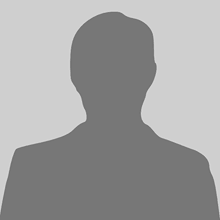 fixme:winsock:WSALookupServiceBeginW (0x3cde0a0 0x00000ff0 0x3cde0e8) Stub! fixme:win:RegisterDeviceNotificationW (hwnd=0x40cba, filter=0x33f748,flags=0x00000000) returns a fake device notification handle! fixme:seh:RtlCaptureStackBackTrace (0, 128, 0x2409e60, (nil)) stub! I am not behind a firewall or proxy server. @hal0815 Try loading up the URL in your browser? @t-ask reports that 1.9.8-staging is good. We should roll with that. What does "1.9.0-staging" provide that doesn't exist in "1.9.1"? Seeing an error in the installer; right after seeing the option to use a cd or download the installer. You can hit cancel...and the installer will continue on. Confusing, but you can get it running. I was running on the lowest settings and getting around 30 fps. The 64 bit version seems slightly worse to me. around 25 fps. I haven't done any hard tests or comparisons. It is likey that I am seeing no performance changes. We might want to remove the MD5 checksum as Guild Wars might be updating their client on the server every once in a while.... Just make sure to use https:// .... I'll submit an update. Update to the latest version of Wine, with PulseAudio support. Frame rate is slow on my machine, but usable. 64-bit works well, both on 1.7.55 and 1.7.35. Add ability to choose 64-Bit architecture. +POL_SetupWindow_menu_list "$(eval_gettext 'Select architecture')" "$TITLE" "auto~x86~amd64" "~" "auto"
-POL_Shortcut "Gw2.exe" "$TITLE" "$TITLE.png" "-dx9single -autologin" "Game;RolePlaying;"
+POL_Shortcut "$FILENAME" "$TITLE" "$TITLE.png" "-dx9single -autologin" "Game;RolePlaying;"
These are the updated commands from https://wiki.guildwars2.com/wiki/Command_line_arguments . POL_Shortcut "Gw2.exe" "$TITLE" "$TITLE.png" "-dx9single -autologin" "Game;RolePlaying;"
ixme:winsock:WSALookupServiceBeginW (0x33dba0 0x00000ff0 0x33dbe8) Stub! p11-kit: couldn't load module: /usr/lib/i386-linux-gnu/pkcs11/gnome-keyring-pkcs11.so: /usr/lib/i386-linux-gnu/pkcs11/gnome-keyring-pkcs11.so: cannot open shared object file: No such file or directoryerr:winediag:SECUR32_initNTLMSP ntlm_auth was not found or is outdated. Make sure that ntlm_auth >= 3.0.25 is in your path. Usually, you can find it in the winbind package of your distribution. err:d3d:context_create Failed to set pixel format 21 on device context 0x60036. err:d3d:context_create Failed to set pixel format 13 on device context 0x5003b. fixme:d3d:getDepthStencilBits Unsupported depth/stencil format WINED3DFMT_UNKNOWN. err:d3d:context_create Failed to set pixel format 5 on device context 0x1003d. err:d3d:context_create Failed to set pixel format 13 on device context 0x1003f. err:d3d:context_create Failed to set pixel format 21 on device context 0x10041. err:d3d:context_create Failed to set pixel format 21 on device context 0x10043. err:d3d:context_create Failed to set pixel format 13 on device context 0x50044. err:d3d:context_create Failed to set pixel format 5 on device context 0x10047. err:d3d:context_create Failed to set pixel format 13 on device context 0x10049. err:d3d:context_create Failed to set pixel format 21 on device context 0x1004b. fixme:winsock:WSALookupServiceBeginW (0x3cde090 0x00000ff0 0x3cde0d8) Stub! fixme:d3d_texture:texture2d_prepare_texture No GL internal format for format WINED3DFMT_NULL. err:d3d:wined3d_debug_callback 0x6e5ed30: "GL_INVALID_VALUE in glTexImage2D(internalFormat=GL_FALSE)". err:d3d:wined3d_debug_callback 0x6e5ed30: "GL_INVALID_OPERATION in glTexSubImage2D(invalid texture image)". err:d3d:wined3d_debug_callback 0x6e8ed50: "GL_INVALID_VALUE in glTexImage2D(internalFormat=GL_FALSE)". err:d3d:wined3d_debug_callback 0x6e8ed50: "GL_INVALID_OPERATION in glTexSubImage2D(invalid texture image)". Installed Adobe AIR, dx9 and changed to newest wine, nothing. This allows the Remeber Account/Password to automatically log in on the launcher. -POL_Shortcut "Gw2.exe" "$TITLE" "$TITLE.png" "-dx9single" "Game;RolePlaying;"
+POL_Shortcut "Gw2.exe" "$TITLE" "$TITLE.png" "-dx9single -autologin" "Game;RolePlaying;"
I have ubuntu 14.04 LTS 64 bit, the newest version of POL and I installed Guild Wars 2 from POL but when i start the game my pc frezes (not even ALT+F4 the only thing that "works" is the restart button). I've tried setting both of my video car as primary during the install but the same result. I had the same problem while using the latest version of the script (17. sep). Guild Wars 2 runs without any errors or graphical glitches for me. The launcher takes around 90-110% of the CPU (even when it isn't doing anything). The game performance is highly dependant on your CPU single-core performance. The FPS ranges from 3 to 50 for me, depending on the area I'm in (lots of players and big cities slow the game down). If you have a great CPU (4.0GHz+ on a single core), you'd find the game to be in a playable state. POL_Shortcut "Gw2.exe" "$TITLE" "$TITLE.png" "-dx9single" "Game;RolePlaying;"
it is actually available in wine-staging. Far better performance for GW2. Updates to the latest Wine. Bug https://bugs.winehq.org/show_bug.cgi?id=30512 is fixed. -POL_SetupWindow_message "$(eval_gettext 'Because of wine bug #30512, dowloading will often crash, just relaunch the client and download will resume from where it stopped. 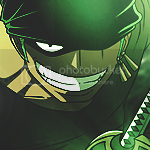 Download percentage reset but do not worry, it do not restart from the beginning.')" "$TITLE"
Installed GW2 with POL game worked good, I had to reduce video settings to performance to get better FPS. However problem is I can't login, launcher/login screen doesn't have blinking cursor in email ID and password fields, thus I can't input any information in those fields. I can't do anything with launcher but to close it. Once in a while (maybe 1 time in 50) I can login and play. Whats the issue? It seems to be working here. Mind testing again? Seemed to work moderately well, only had one crash while trying to install, and had an issue were the game didn't show up but it changed my curse. I press Alt+F2 about ready to xkill it, then it showed up. Only major issue I had was the slow FPS. About 7-10 FPS even on the lowest settings. Running x2 AMD Radeon 6870's. Guild Wars 2 is unable to start because another copy is already running on this computer, or because the application has insufficient rights to successfully detect whether another copy is already running on this computer. Ok so this would make the trick. Thank you Quentin PÂRIS. POL_SetupWindow_message "$(eval_gettext 'Because of wine bug #30512, dowloading will often crash, just relaunch the client and download will resume from where it stopped. Download percentage reset but do not worry, it do not restart from the beginning.')" "$TITLE"
Not sure about setting it to the full screen resolution. When downloading, it blocks your ability to do anything else on your desktop. My recommendation would be to set it to 1280x720. Works fine although I had to manually set wine config to emulate a virtual desktop in order to prevent gw2 launcher to freeze. I updated installation script to set it automatically. +	Set_Desktop "On" "$X_RES" "$Y_RES"
Have you tried with a more recent version of wine by the way? I looked for POL_LoadVar_* command but it seems to not be documented (at least I didn't found it). So I don't know how I can use it to get screen resolution. I did tried 1.7.1-GuildWars2 prefix & it works as good as 1.5.28-GuildWars2. I tried also 1.7.4-CSTM & 1.7.23 but I have the mouse stuck problem when I try to look behind me IG. Nice Post! I also read your blog and Microsoft Microsoft Certified Professional Exam Braindumps I very impress and I'll go to bookmark your website. After the installation with playonlinux, when it launch the file to download the game, it crash imediatly at 0% of the guild wars2 launcher update. I had to reset the computer twice. same here , the crash stalls somehow the xserver , if you log on a console you can see the process and the download is running.